As Mayor Bill de Blasio was giving a speech at the funeral of Rafael Ramos, a NYPD officer killed in an ‘execution’-style attack, attending police turned their backs to the screen in protest. Blasio is accused of siding with Eric Garner campaigners. More than 25,000 police officers from across the country attended the funeral of Rafael Ramos at the Christ Tabernacle Church, in the Glendale neighborhood of Queens in New York. Ramos and Wenjian Liu were shot dead at point blank range last week, as their car was ambushed ‘execution style’ in Brooklyn. The perpetrator fled the scene and committed suicide. But this was met with rows of backs. Sgt. Myron Joseph of the New Rochelle Police Department told ABC that the officers turned their backs to "support our brothers in the NYPD." The NYPD did not comment on the officers’ decision. 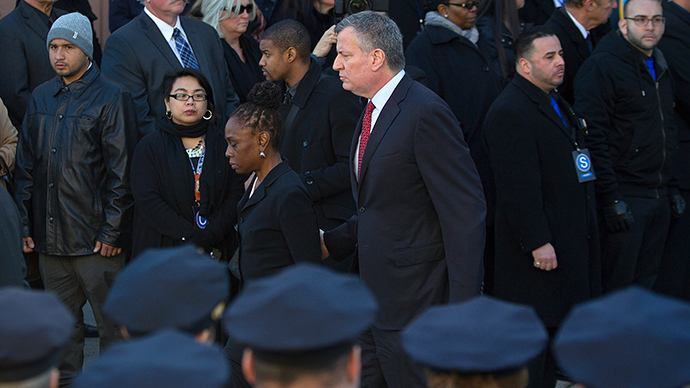 This was not the first time NYPD officers have chosen to turn their backs on de Blasio. The same happened last week when the mayor visited the hospitals where Ramos and Liu were taken. There was also an incident of a plane flying along the Hudson River on Friday, flying a banner: “De Blasio, our backs have turned to you.” Former cop John Cardillo issued a statement that a “large and unified group of current and retired NYC police officers, detectives and supervisors” asked him to issue a post on the plane after it appeared on Friday. “We are outraged by the mayor’s incendiary rhetoric and for facilitating the current hostile climate towards the NYPD,” Cardillo's statement said. Controversy around de Blasio began with his response to demonstrations against police brutality towards minorities, with many police officers feeling the mayor took the side of the protesters. Things escalated after a grand jury’s decision not to indict an NYPD officer in the death of Eric Garner, a Staten Island man who died after being put in a chokehold during an arrest. Later, when talking to demonstrators arrested for assaulting police during one of the demonstrations in New York, de Blasio referred to their actions as “alleged" – a wording, which was interpreted as taking the side of the protesters. 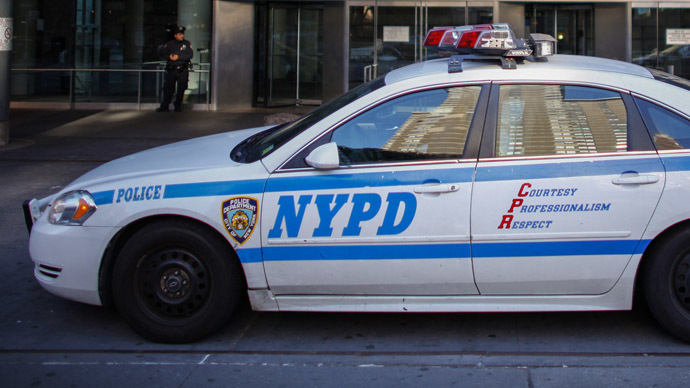 Furthermore, at the beginning of December, de Blasio and Police Commissioner William J. Bratton announced "significant changes" in police retraining. “People need to know that black lives and brown lives matter as much as white lives,” de Blasio said at that point. 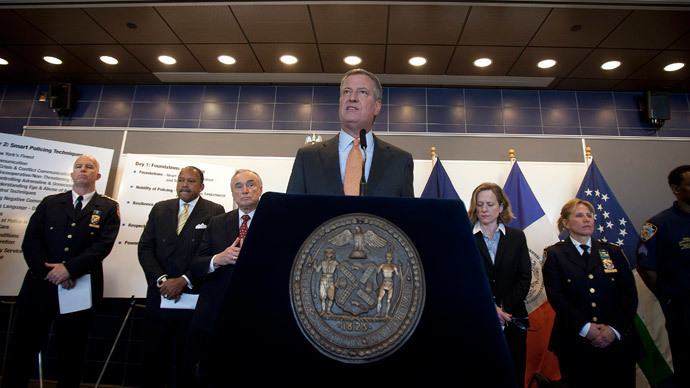 Following the news, New York City's largest police union the Patrolmen’s Benevolent Association (PBA) started a petition to stop de Blasio and Council Speaker Melissa Mark-Viverito from attending their funerals, should they be killed in the line of duty. “I, as a New York City police officer, request that Mayor Bill de Blasio and City Council Speaker Melissa Mark-Viverito refrain from attending my funeral services in the event that I am killed in the line of duty,” the petition states. 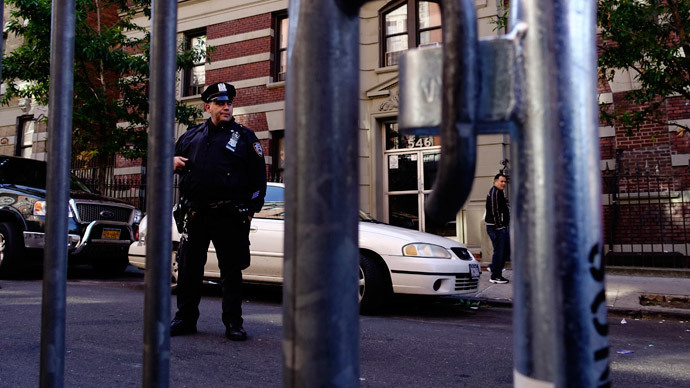 Meanwhile, the NYPD said on Friday that it had posthumously promoted Ramos and Liu to the rank of first-grade detective. They were the first officers to die on duty in New York since 2011.